Plumbing repair: do it yourself or call a professional plumber? Almost every homeowner has a list of needed repairs and potential upgrades. It seems like even in the most modest homes, the work is never finished. Oiling squeaky hinges, replacing cabinet pulls, upgrading light switches, and mending fences. Do it yourself fixes are all part of the joys of homeownership. Some of us are regular Bob Vilas and other homeowners are just learning how to tell a flathead and a Phillips head apart. At Benjamin Franklin Bay Area Plumbing, we get a lot of questions about DIY plumbing and when to hire a plumber. 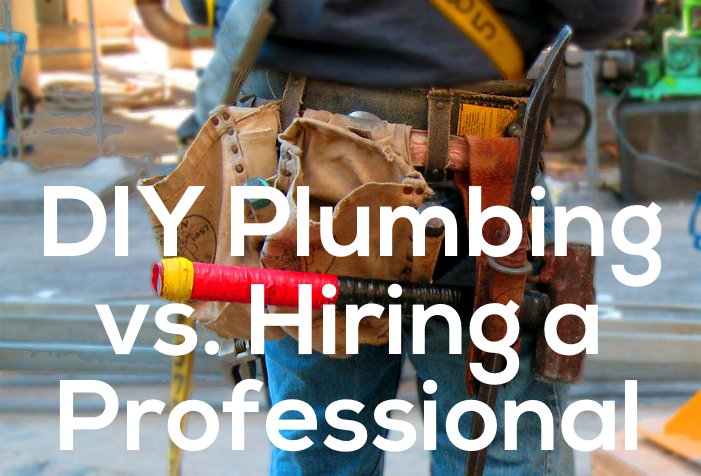 We’ll give you the guidelines on plumbing: do it yourself vs. professional plumber. Know how to shut the water off at the water main and for each fixture. People often get intimidated by plumbing. They imagine hundreds of gallons of water rushing from a broken toilet and no way to shut the water off. The good news: you can always shut the water off. It is best to locate your home’s shut offs and practice accessing them BEFORE you have a plumbing emergency. In most homes the main water shut off is located at the property line where the water enters the property or right at the water meter. For individual fixtures like a sink or toilet, the shut of for that fixture is located under the sink or behind the toilet. If you are new to DIY plumbing, these are pretty good jobs to get your feet wet. (We hope not literally!) Experienced DIY plumbers have probably already performed most of the tasks on this list. Just make sure to read several different articles about accomplishing your task, have a detailed set of instructions, and make sure to have all needed parts and tools on hand. Leaky Faucets– Grab your tool box and go for it! Fixing a leaky faucet is fairly straightforward. Clogged Toilet– DIY toilet repair for clogs is easy! Grab your plunger and plunge away. Need some help? Learn 7 ways to unclog a toilet. Clogged or Slow Draining Sinks or Showers– This is an easy DIY task. We’ve got tips on how to unclog a shower drain and how to unclog a kitchen sink. Installing a New Shower Head– Whether you like a gentle rain or a vigorous massage, there are showerheads for every water pressure preference. Just follow the manufactures’ instructions for installation. Installing a New Faucet– A new faucet can give your bathroom or kitchen an instant upgrade. Just remember to turn the water supply off first. Unless you are a pretty experienced DIY plumber, proceed with caution on the following plumbing repairs and installations. These projects have the potential to cause flooding and property damage if performed incorrectly. Get DIY plumbing advice before attempting these projects for the first time and call a professional plumber if you get in over your head. Plumbing on a Recently Purchased Property– Can you recognize polybutylene pipes? Are you able to spot an improperly sloped waste line? Slow down partner. If you are planning a couple DIY plumbing projects on a new property, it might be a good idea to have a plumber come out and take a look at your home’s plumbing to see if it is up to code. This can save you money in the long run. Replacing a Toilet– The water supply and waste lines are already in position, so simply replacing a toilet is not too hard. The consequences of performing the job incorrectly might be more then you are willing to deal with, especially if you only have one bathroom in the house. Replacing a Dishwasher– Not a super difficult job, but there is potential for flooding and leaks. See our blog post on installing a dishwasher. Replacing a Garbage Disposal– Many steps, but again, not a super difficult job. The major concerns are flooding and leaks. Frozen Pipes– Frozen pipes are not a major concern in the Bay Area, but it does occasionally happen. Use extreme caution when trying to taw pipes or call a plumber to have your pipes correctly thawed to prevent breaking and water damage. Even professional contractors and house flippers hire plumbers for most of their plumbing jobs. The consequences of improper plumbing are simply too costly and inconvenient. Renovations– Most renovations require permits, especially plumbing. You can be reported and fined for unpermitted work. When selling home, you will have to disclose any illegal work. Even worse, you could have to tear out drywall, countertops, and tiles to inspect or replace unpermitted work. Always use a professional plumber and electrician who will pull the proper permits for your renovation job. Moving Pipes or Fixtures– Moving plumbing fixtures is a job for professionals and usually requires permits. Broken Pipes– Professionals only! Broken pipes are a big problem. You’ll not only need a plumber to fix the broken pipe, but also to determine why the pipe broke and to inspect your home’s plumbing system. Installing a Water Heater– It is important to install water heaters correctly for safety. Call a plumber. Next time a dripping faucet keeps you awake, go ahead and fix it! If you want to add an additional bathroom, schedule an appointment with a reputable plumber. If you do decide to DIY, don’t forget to read about some of the most common DIY plumbing mistakes and how to fix them. DIY home repair is a great way to learn more about your home and increase your skill set. Just be sure to double check what you can do yourself and what you need to leave to the professional plumbers. How to Drain Pipes for the Winter: Avoid Frozen and Burst Pipes!